Book your Cheshire Wedding band today with Adam Chandler! You'll be grinning like a Cheshire cat with Adam Chandler's bands setting the scene at your wedding. Cheshire weddings, Chandler's sounds. Whatever you want, wherever you're getting married. Adam Chandler and his range of stylish, talented musicians and wedding bands are well-placed to put the finishing touches on your special day. Whether you're going for scene-stealing, sweeping soundtracks, or are looking to be cool and classic, Adam has the bands to bring you the soundtrack to your love and your lives. 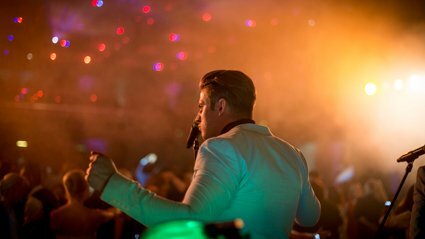 With over ten years performing at weddings and venues across the UK and abroad, you're guaranteed to be in safe hands when you let Adam Chandler handle the music for your magical moment. From first dance to final fling, a big day is made by big sounds and big style. And there's none bigger or better than the musicians that make up Adam Chandler's wedding bands. Weddings bring people together, people of all ages and experiences. And, sometimes, it can be difficult to set a scene that pleases everyone. With Adam Chandler and his wedding bands and musicians, you don't have to worry about Great Aunt Maude's disapproval, or the young guests feeling left out. Adam and his musicians will create a truly memorable occasion that will include everyone, from the youngest to the eldest of your guests. Whether it's the romping sounds of the Rat Pack, or the smooth sophistication of James Bond, a sweet, subtle solo or a big band bounce, Adam Chandler can give you the perfect music, and the perfect wedding. Soundtracks. Serenades. Being swept off your feet. It's all part of the service when you hire your wedding band from Adam Chandler. More Wedding Bands in Cheshire! Wedding Bands available around Cheshire and beyond!